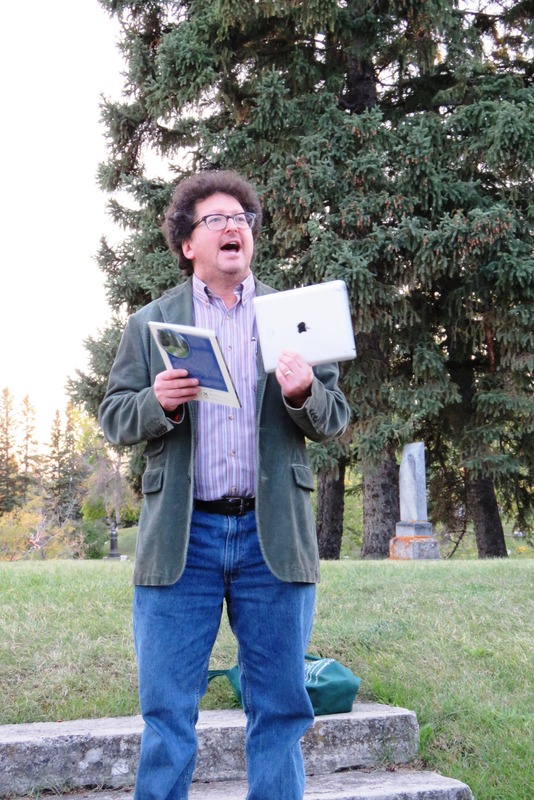 This was the first time that I attended the Equinox Vigil. 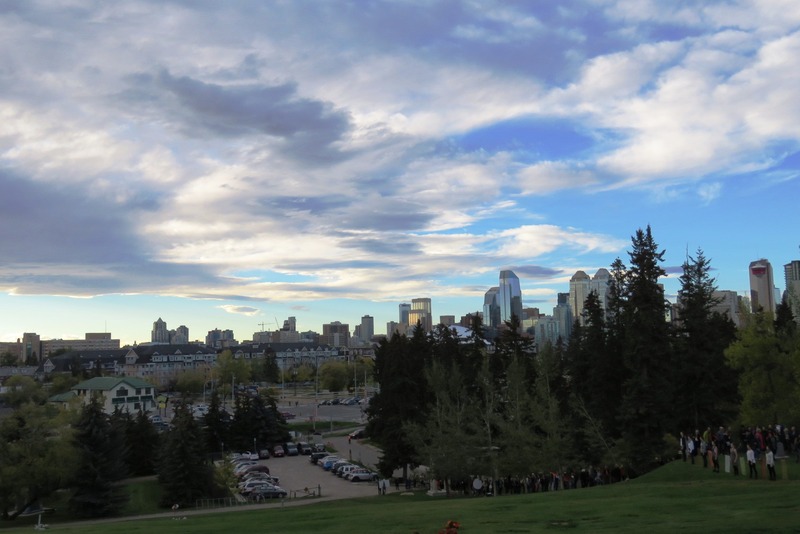 I was primarily motivated because it was a lovely evening for weather. For the first days, leaves were dancing down the street…a slight wind, warm sun, blue sky dappled in cloud, cool air. It was a perfect autumn evening. The fall equinox falls on Wednesday of this coming week. I thought that I would bring to the non-denominational event, thoughts and prayers for my dearly departed Mom and my family. 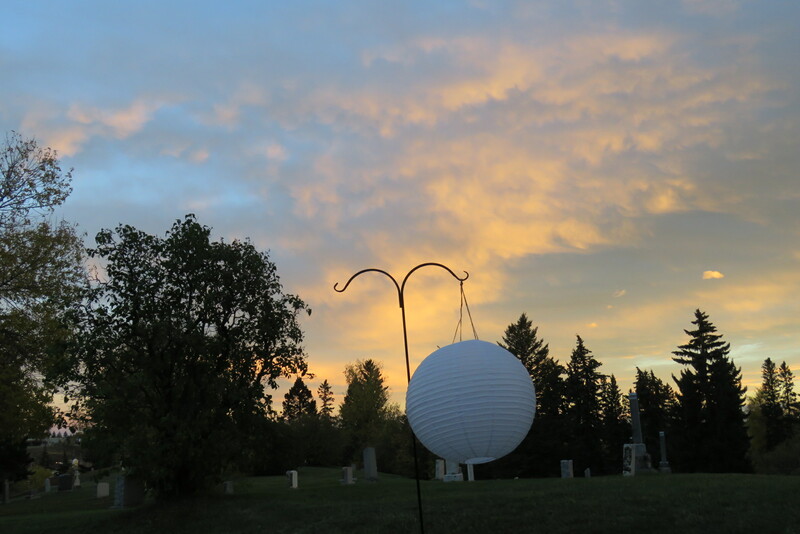 I would open up to a reflective and prayerful evening in the Union Cemetery. 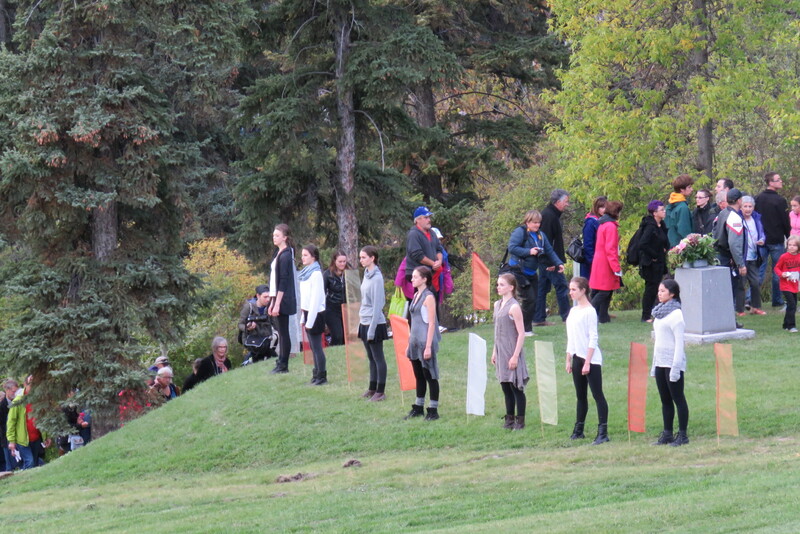 The evening opened with a beautiful sky and dance. This piece, Rico. 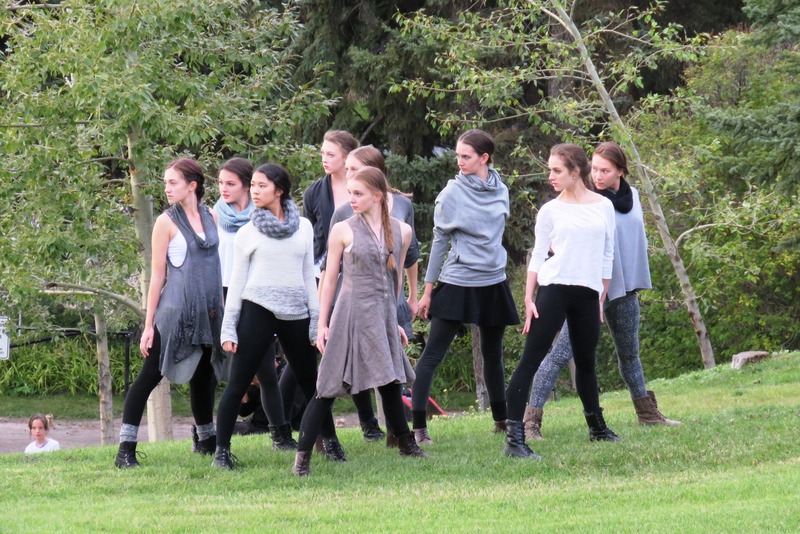 Michael was a piece created with Calgary’s departed, Michael Green, at heart. 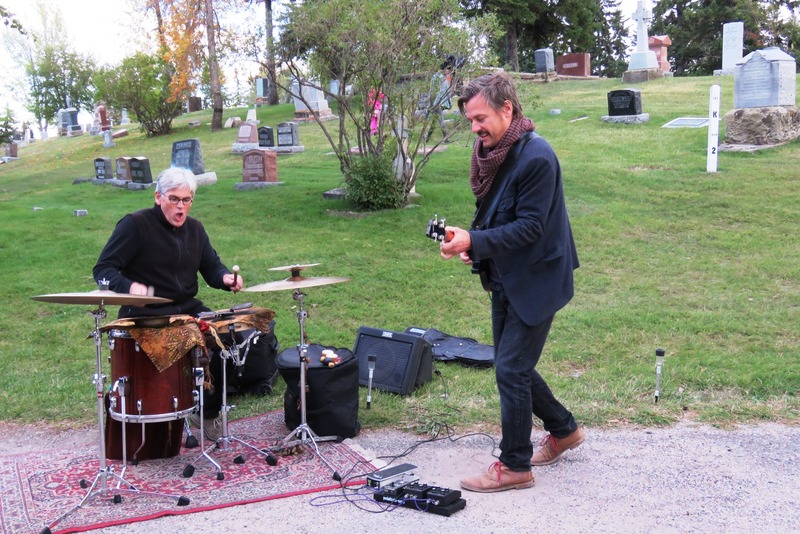 Various musicians were present to the event…first and throughout the evening, Simon Fisk and Robin Tufts. Their music was both haunting and spirit-charged. Absolutely beautiful. I stood in the dark at one point and just listened and was moved because of this powerful setting. 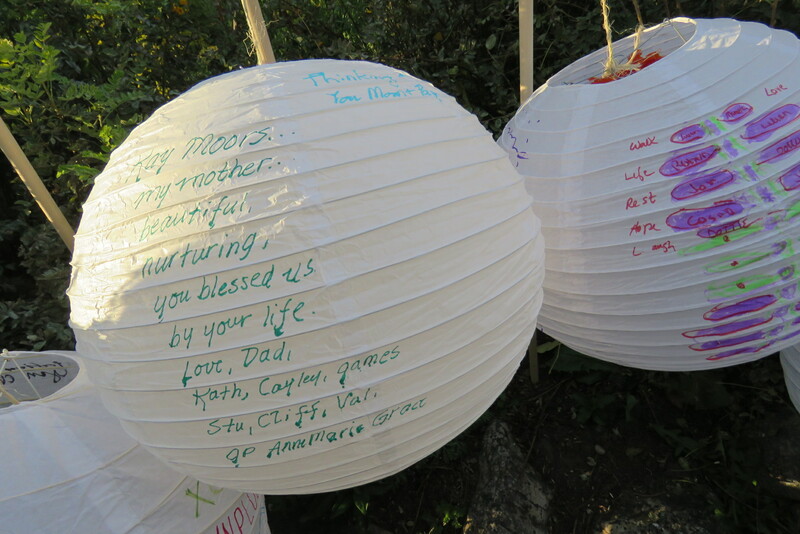 I wrote Mom’s name on one of the Memorial Lanterns, lanterns that would be processed twice throughout the evening…light in a dark place. 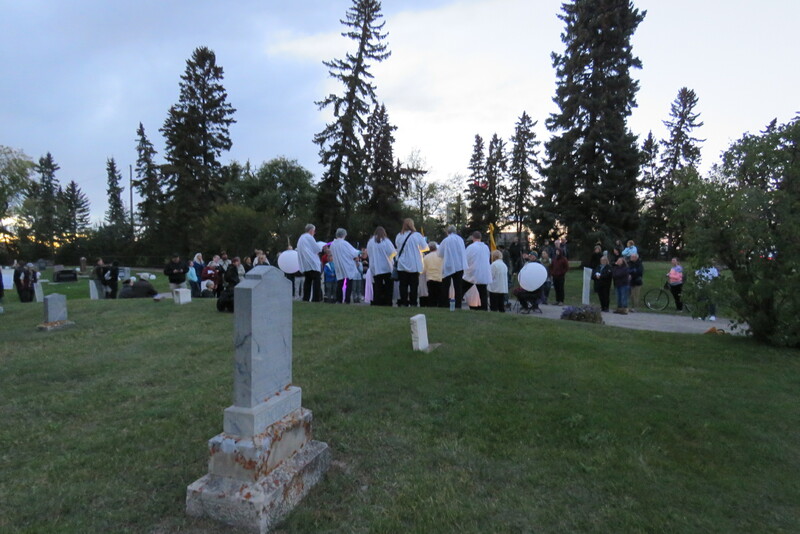 This ritual felt a lot like writing Mom’s name into the Book of Remembrance at my parish church. Each year, when the Book of Remembrance is placed for all to see, I pray for her peace and our peace…those left behind and missing her. and Kris Demeanor, poet and musician. 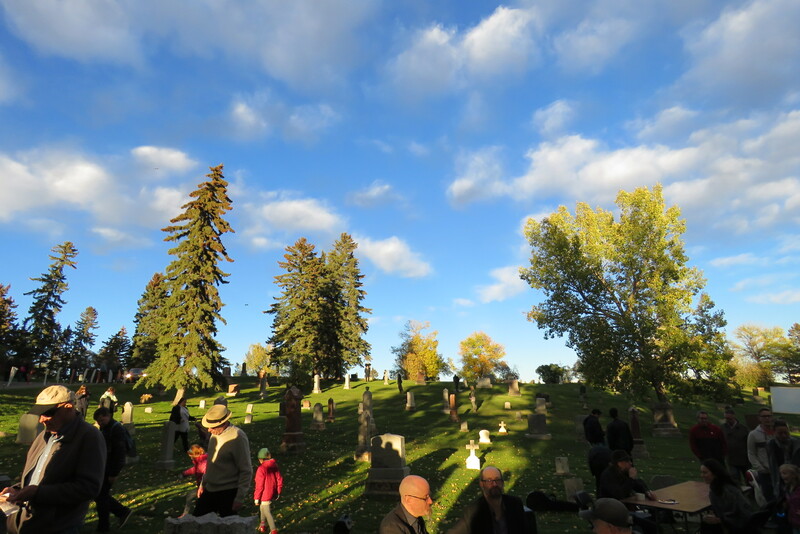 At the top of the hill, at the M Horseshoe of the Union Cemetery Rayne-Anne Latchford illuminated lives, by sharing with us, a number of stories of personalities who lived in Calgary, but who passed and are now laying, for the most part, in unmarked graves. She has a passion for history and for the narratives of people. She also spoke beautifully about how ‘now’ is the time to share stories with one another and to connect with our families. It is the stories that will remain. I could listen to historian, Harold Sanders for hours. 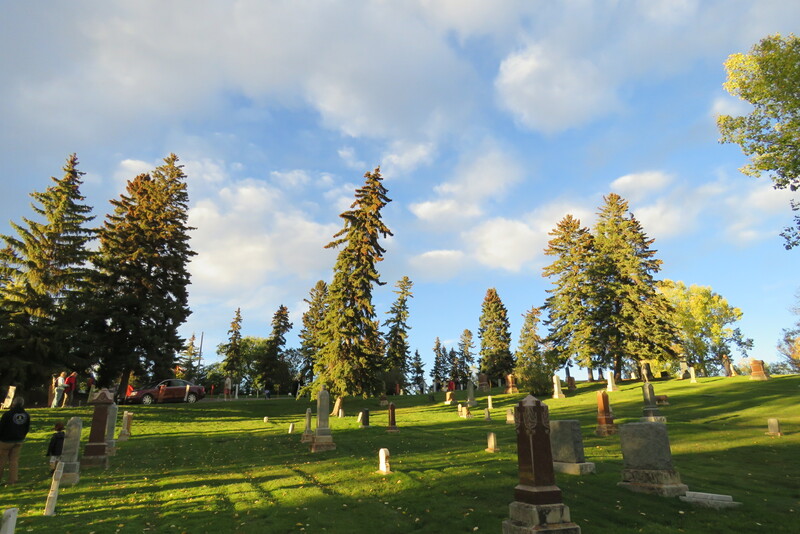 Thank you, for sharing with us history of Calgary’s cemeteries and letting us know just how much we can learn from the people who are resting in our midst. 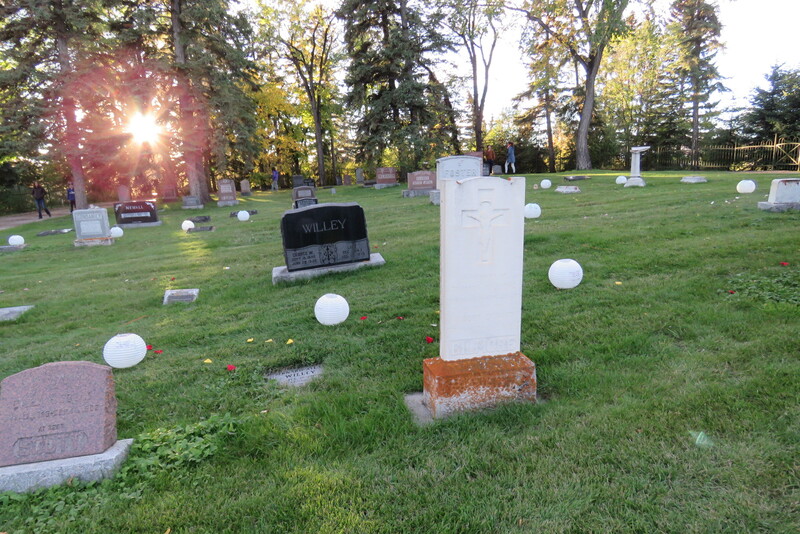 I hope to have opportunity to return to Union Cemetery in the light of day and make some discoveries on my own. Being surrounded by music for the evening added to the atmosphere of the sacred. 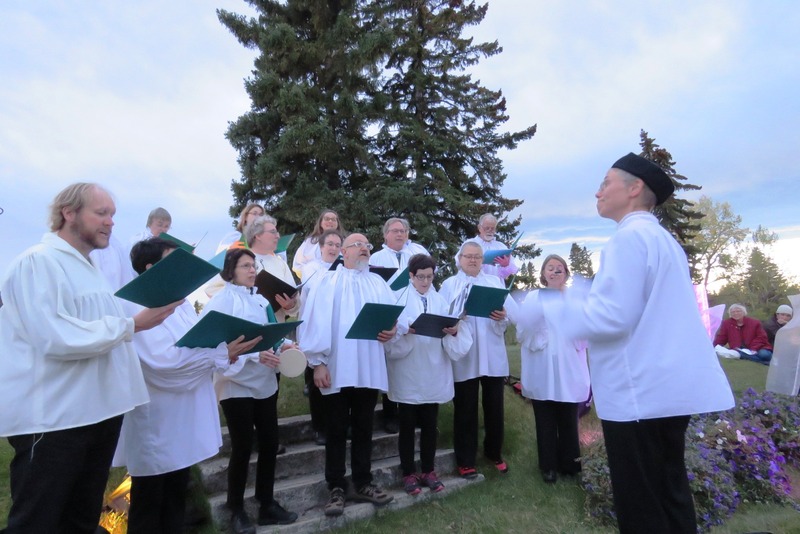 Thank you to the Calgary Renaissance Singers & Players for their beautiful sound. 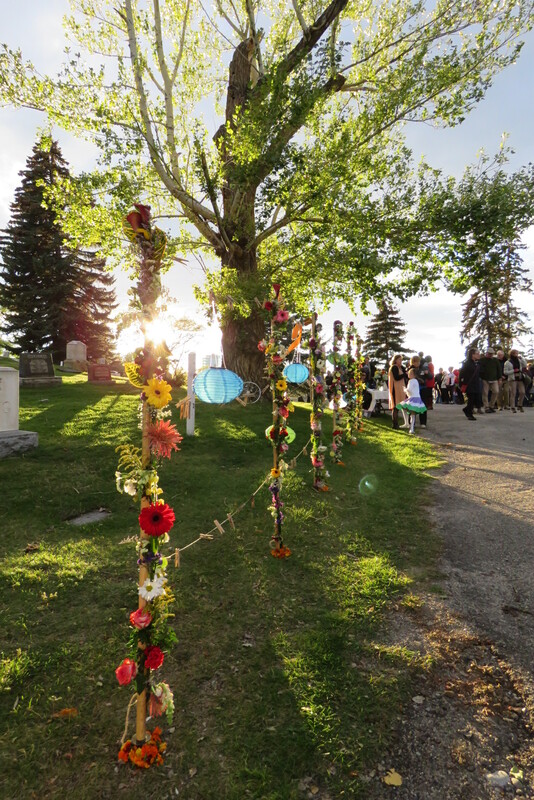 Beautiful installations were sprinkled throughout the Cemetery pathways…this one, the Breath of Life Memorial by Eveline Kolijn. As it became dark, I settled in with a hot cup of spiced tea and chatted with friends. It was good to see you Michelena, Billy, Jenn, Bev, Bill, Steve, Don and friends and Dale. 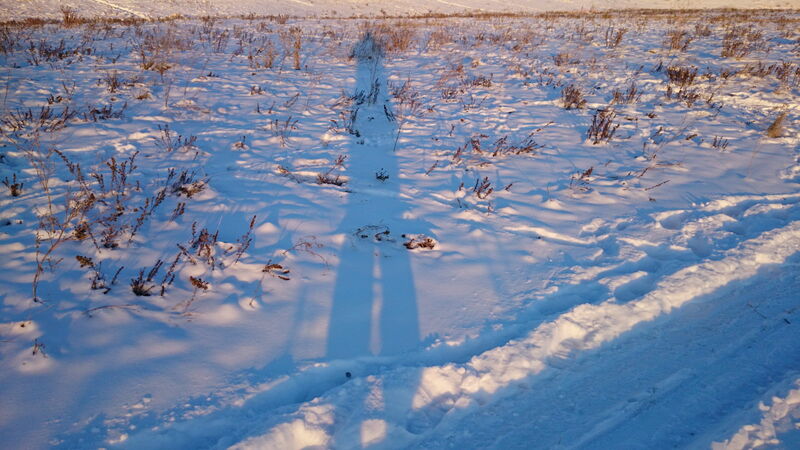 Walking alone, down the hill, the sky appeared lighter than the ancient evergreens that flanked me. I looked up and gave thanks to my ancestors. 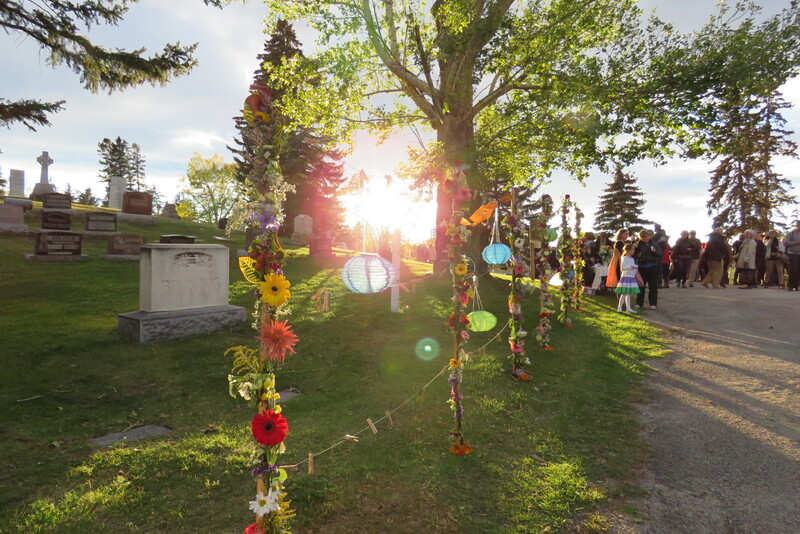 I also prayed for the many students who have passed away since teaching them…for my daughter’s and son’s friends who have passed…for my relations, most recently, my Auntie Margaret and my Uncle Bob. I was blessed some time ago to receive a private message from a student who is now grown up and wears a beard…someone who has lived some life. I hadn’t heard a word from him for years, but these words, like magic, appeared. If these were the last words I was to read on this earth, I would be blessed enough. But, it seems that again and again, I am graced by these experiences. And it is, I’m certain, because I live in a time when the words can be communicated. I know how grateful I remain, as a 59 year old woman, for my teachers. Where are you Brenda Draney? It was blustery. I thought about the slowest way I could possibly drive to the Esker Foundation, located on 9th. I have attended other events related to the exhibit (film viewing, panel discussion, artist talk) since the opening of Fiction/Non-fiction. 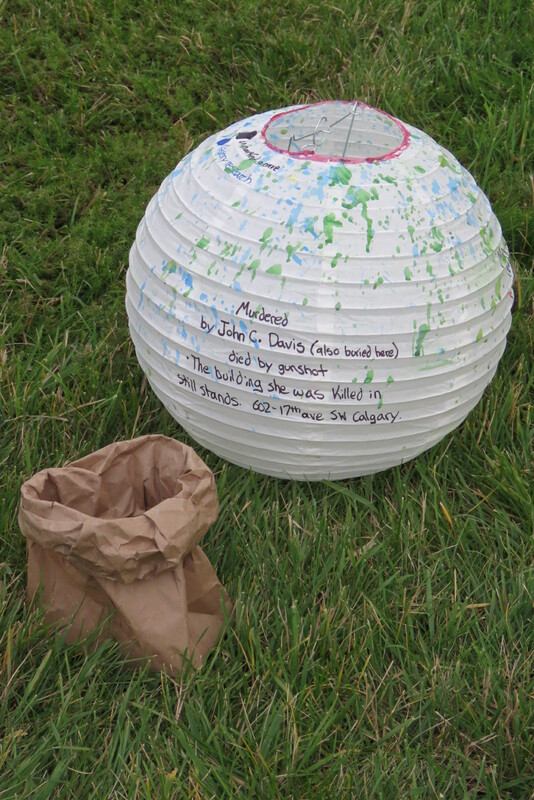 There was no way weather was going to keep me from a painting opportunity where Brenda Draney would be doing some sharing…some wandering…some listening. 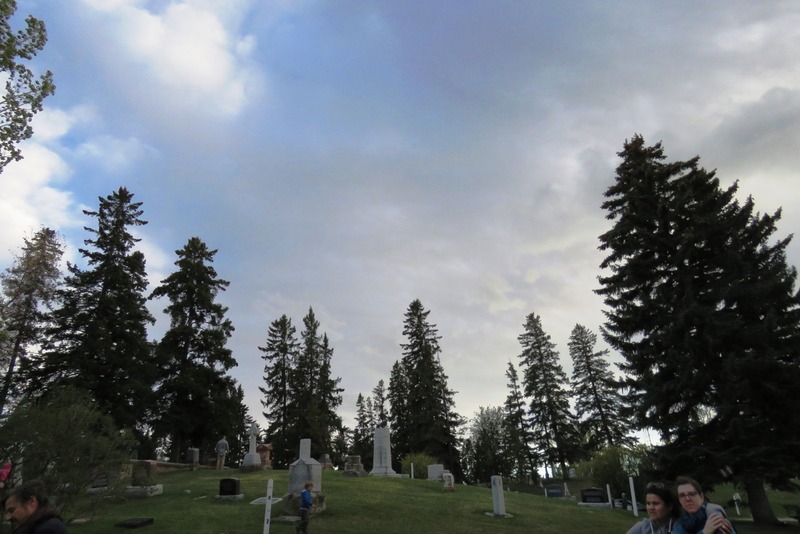 Everything I’ve been ‘incubating’ about since Mom’s passing (story, connection, identity, loss), would be a part of the afternoon’s experience…so, I was going to forge through the weather, regardless. Once I arrived, I chose a seat that faced out toward the street…wide, tall windows stretched before me. I could see onto the neighbouring roofs and watch the snow blowing. Above me, the pod that houses the administrative space…a nest-like feature, caused an immediate sense of comfort and coziness. 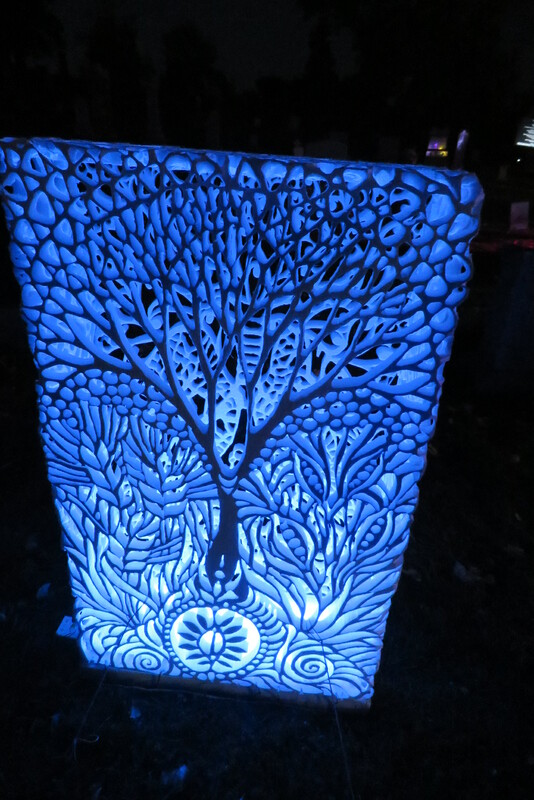 Meeting Sharon, the artist across from me, led to a very quick and impact-full connection. I felt happy. 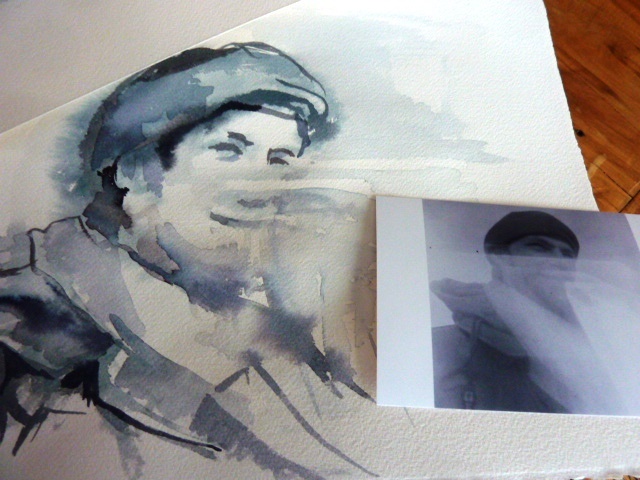 I had dumped a pile of old black and whites into a zip lock bag before leaving home and proceeded to shuffle through them, looking for references. It didn’t take me long. I won’t go into details…I won’t share the stories that connect me with the images…but, I will say that there was an immediacy. 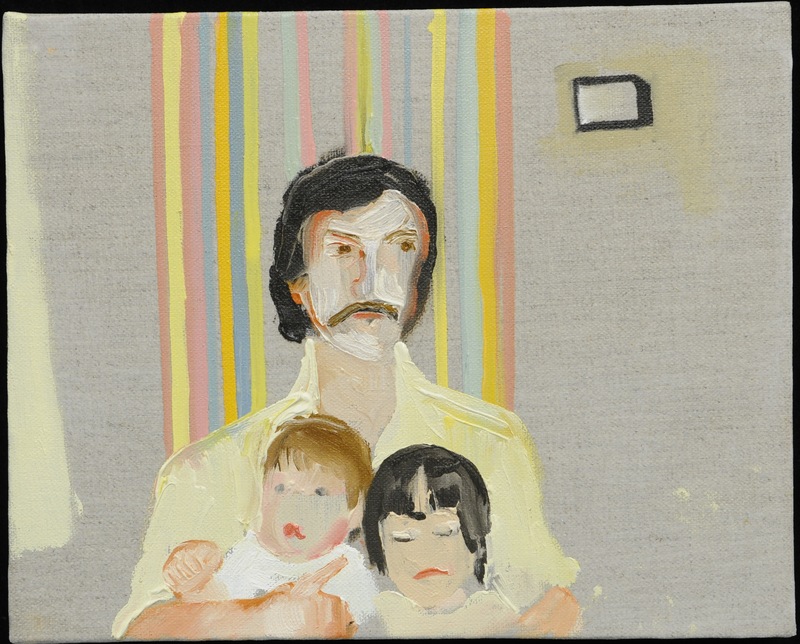 Topics shared on my visits with Brenda and Sharon yesterday afternoon included, but certainly weren’t limited to; identity, memory, stories, mothers, objects of affection, nostalgia, art, teaching, journals, writing, voice. At the conclusion of the afternoon, I felt so empowered and so grateful. Brenda Draney is like an angel who was brought into my circle for the purpose of some reflection…some connection and some healing. It was the most delicious of afternoons, and certainly a gift to myself. Thank you, Brenda. 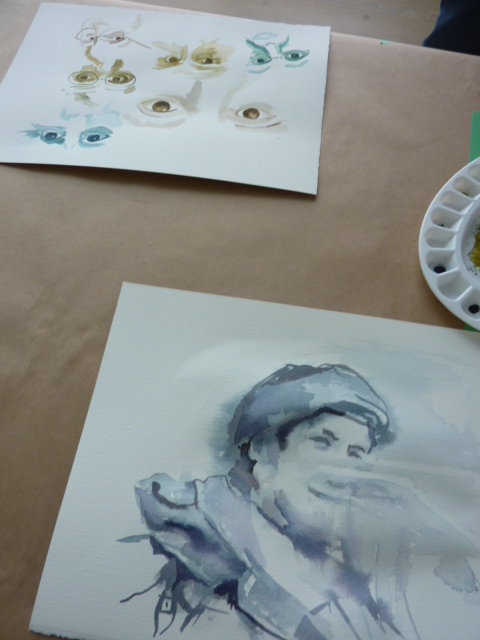 Technically speaking, it was a tricky thing to choose to use greys for the entire day…but, this session wasn’t so much about the technical aspects of watercolour (a completely foreign medium), but about meaning. 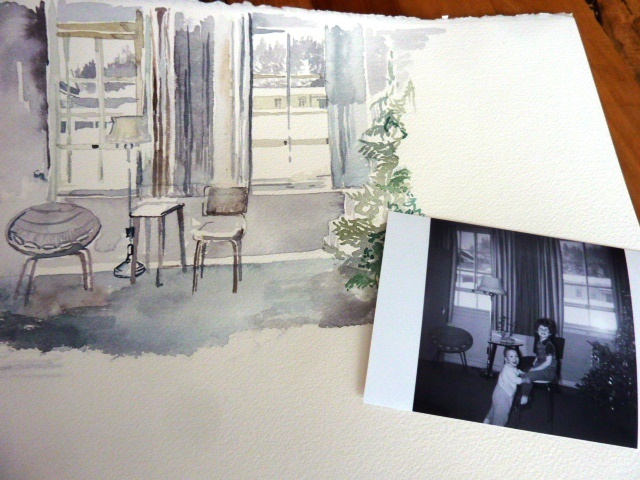 I spoke to Sharon about the curtains that Mom had sewed on her treadle sewing machine, even when we were in military-poverty in those early years living in Ste. Sylvestre, Quebec. Incubator: Brenda Draney from Latitude 53 on Vimeo. Each year, I remember. As I delve deeper into my family history, I actually become more and more connected to our story. 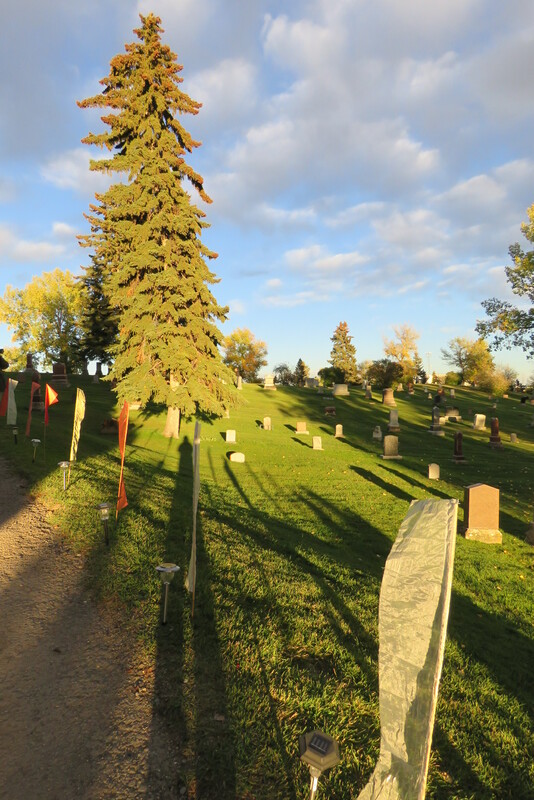 Some people opt out of the recognition of Remembrance Day, but for our family, there are some deep and important reasons why we take time to pause and reflect on the sacrifice of our own family members. I am going to merely link to the stories that I have, in the past, posted here. 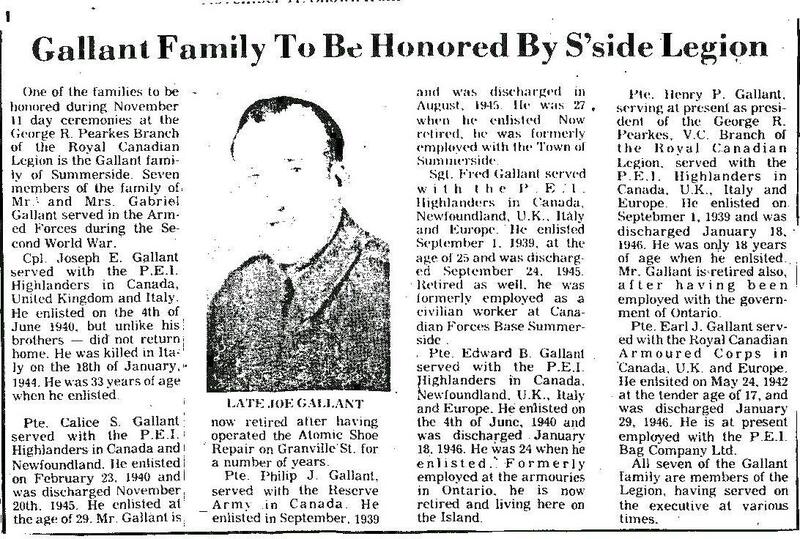 My Uncle Joseph Gallant in photograph…killed at Ortona, Italy. 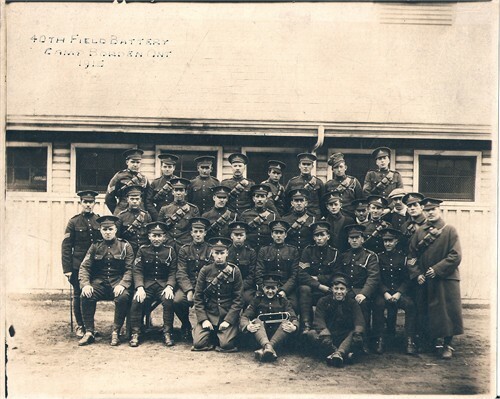 Great Uncles George and Walter Haddow, both served with the 40th Artillary Battalion to leave out of Hamilton, Ontario. Yesterday I ended up on another tangent. My retirement seems to be an entire series of tangents, that seem for a time to be about everything else, but always lead back to me, my identity and what my soul speaks. 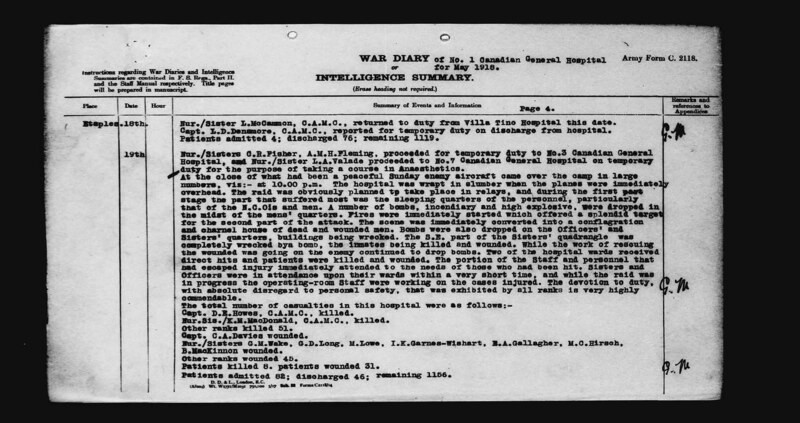 My great grandfather John Moors of the 54th Battalion was in a #51 General Hospital bed near Etaples. 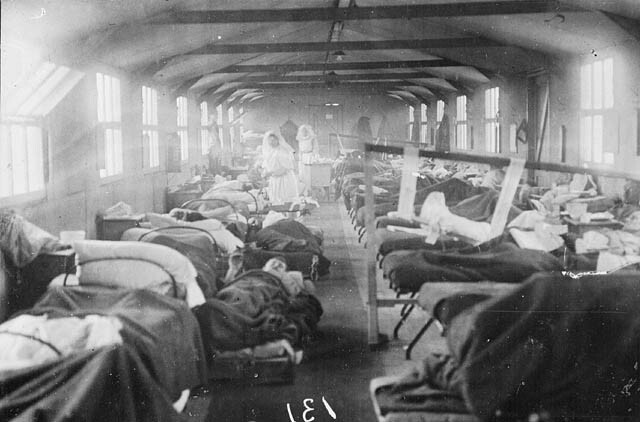 Out of nowhere, on the night of May 19, 1918, the enemy conducted a shameful air strike that left nurses and many patients wounded or as in my great grandfather’s case, dead. 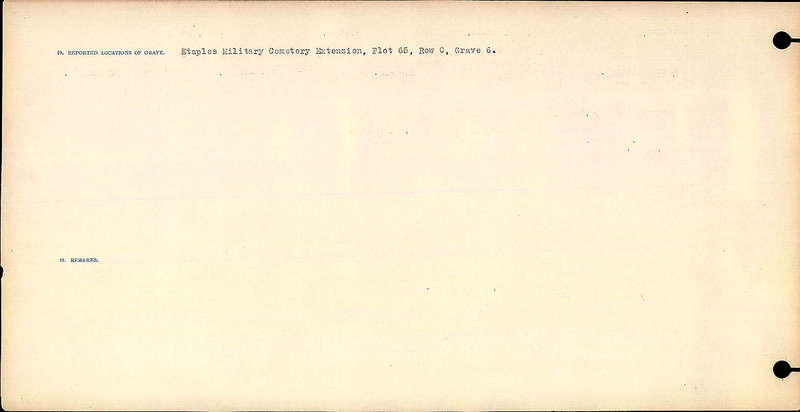 Thanks to The Great War forum and other Canadian archives, I was able to find several artifacts, including this silent film, an actual archive of the devastation, that relay the horror of that night. I am left to really think about the countless men and women who lost their lives in the years 1914 to 1918. 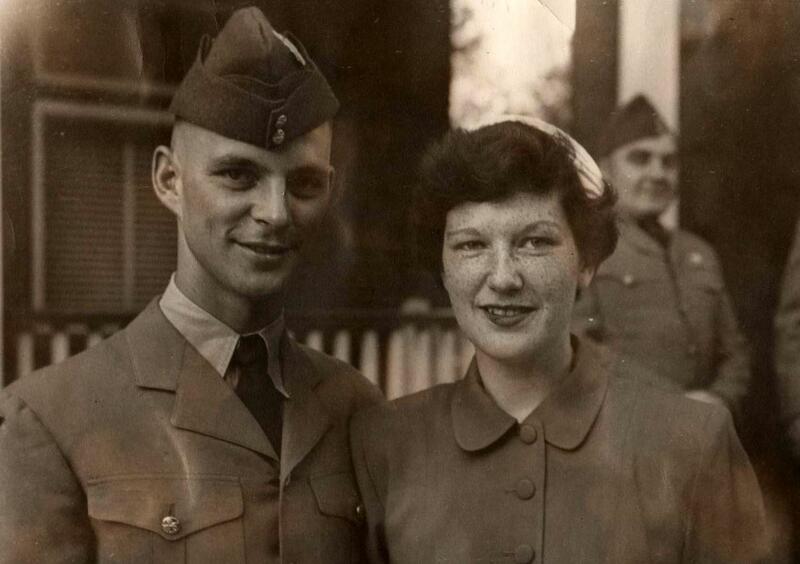 I feel the strength and courage of my family of soldiers coursing through my own blood. It is a sacred bloodline. Map of Etaples Training Camp found on The First World War Poetry Digital Archive: Link for Site Follows. 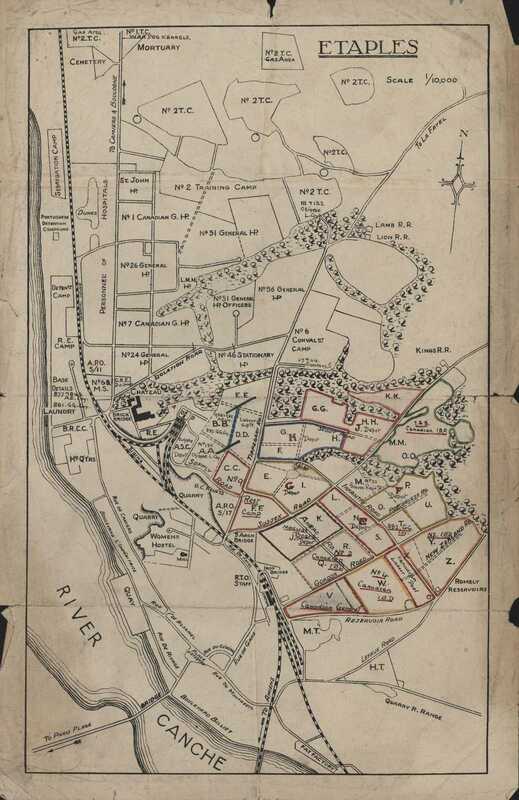 The above map was accessed here, with the primary contributor being listed as The Great War Archive, University of Oxford. 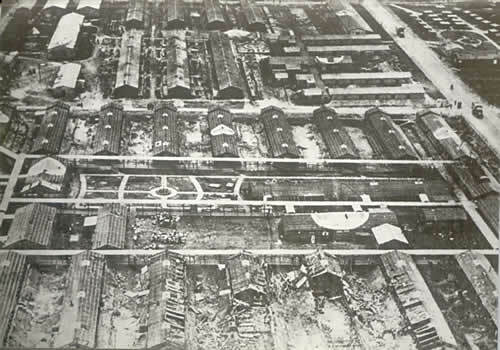 Source of Image: Through These Lines Air Raids See Link Below. Link for Through These Lines: Research Etaples Here. 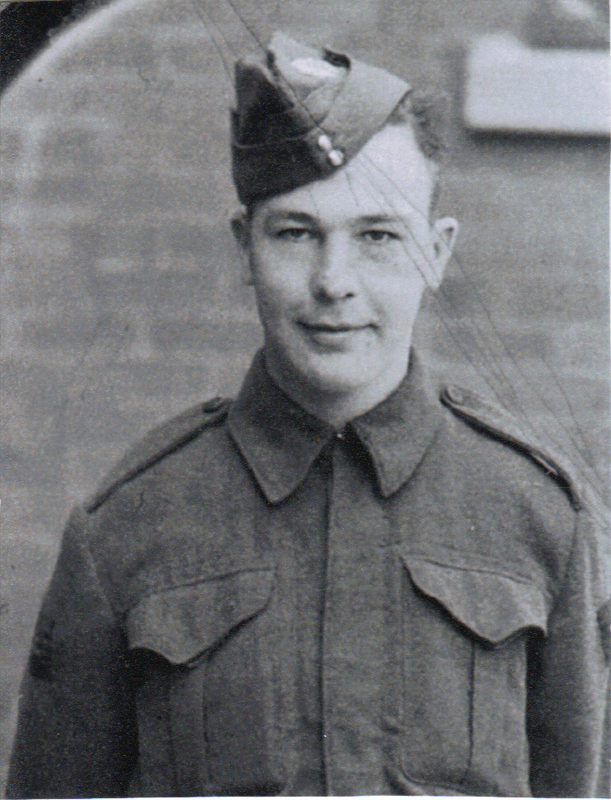 Read details about the air raids and peruse various links to War Diaries. NFB film may be viewed here. 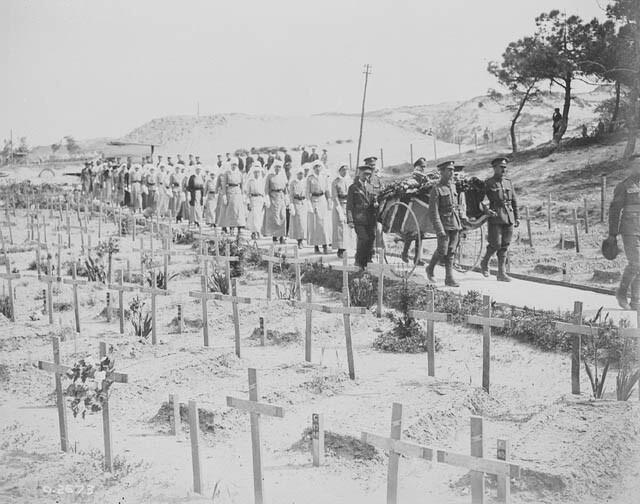 I am including, here, an image of the Etaples Military Cemetery, in order to recognize the powerful image of so many lives lost. 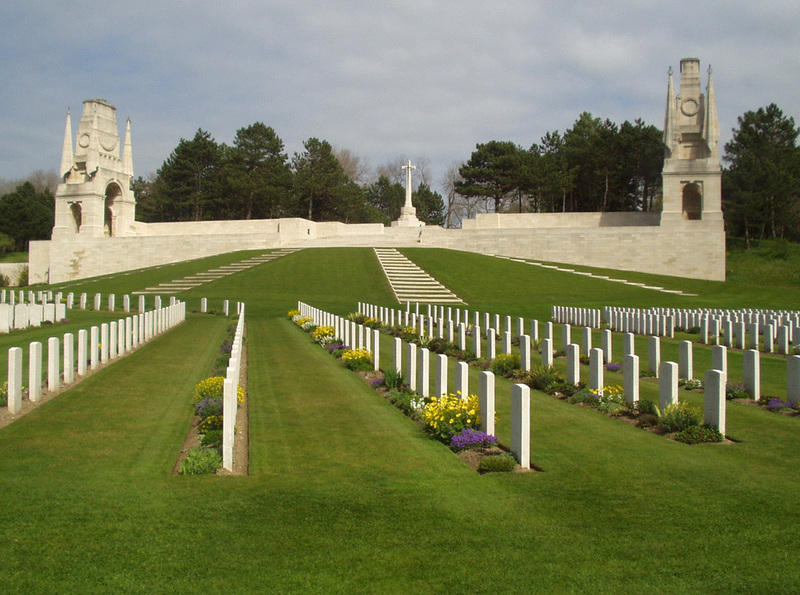 Etaples Military Cemetery: Here rests my great grandfather. Subsequent diary entries took place when the Matron-in-Chief makes her visits. On the 22nd…she writes. 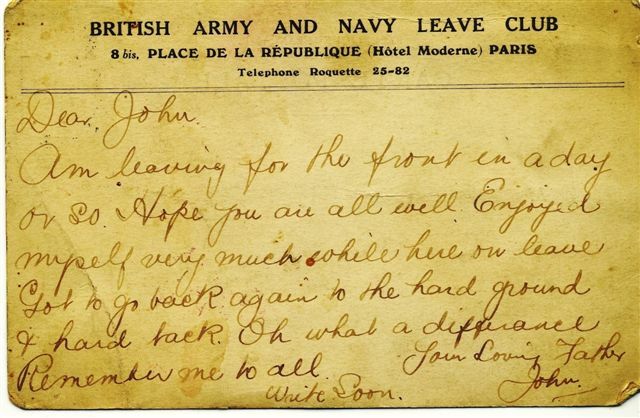 “Left for Etaples in the afternoon, arriving at the DDMS office at 7 p.m. Went with the A/Principal Matron, Miss Stronach, to No.1 Canadian General Hospital where I called upon the Matron, Miss Campbell, and inspected the quarters where the recent terrible raid had occurred and saw the rooms which had been absolutely destroyed, also the adjacent building of HRH Princess Victoria’s Rest Club for Nurses which is more or less in ruins. The only thing left intact in the building was Her Royal Highness’s picture which was on a small table on the ground floor, neither table nor picture being touched. I saw the seriously wounded Sister, Miss Lowe, CAMC who was being nursed in a hut as her condition was too serious to allow of moving her to the Sick Sisters’ Hospital. She was just conscious but was very ill.” Sister Lowe later succumbed to her wounds. 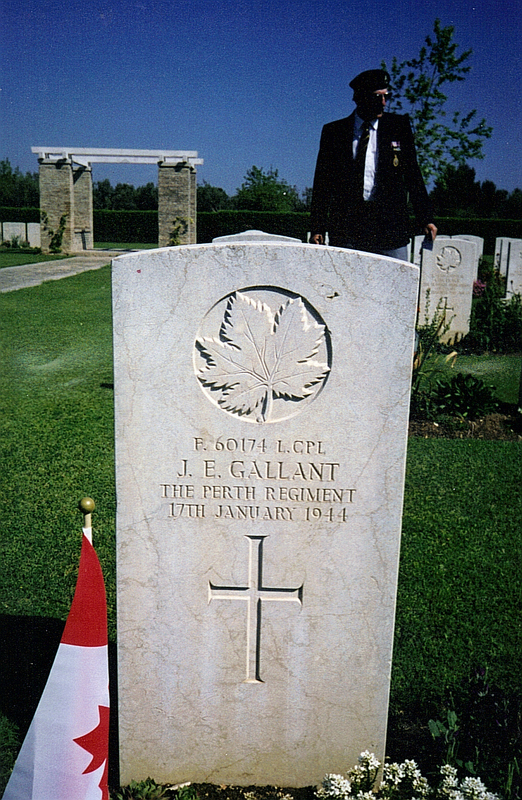 The Canadian Great War Project details my Great Grandfather’s military information here. 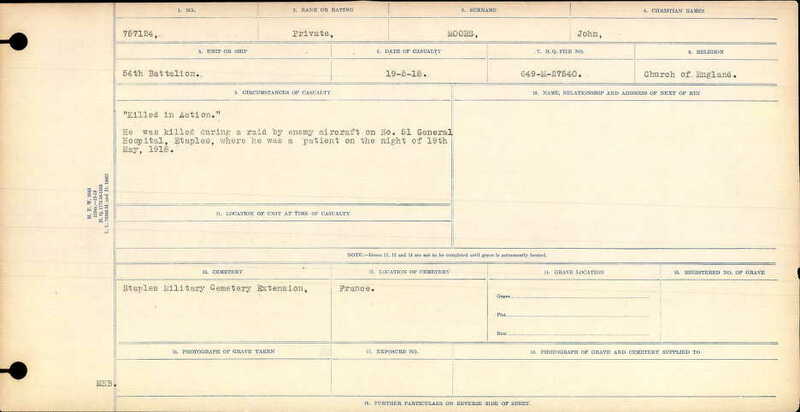 My efforts to link to the Library and Archives of Canada collections seems to be a problem when linking to my great grandfather’s attestation papers. My great grandfather, John Moors, is mentioned and the circumstances of his final hours are described in the following documents. 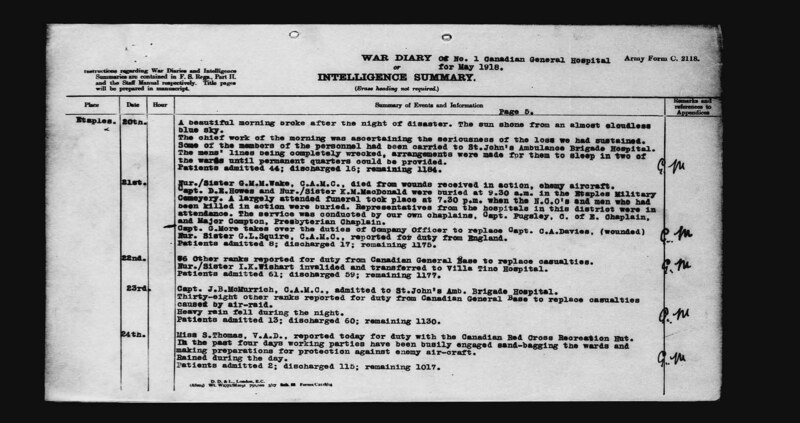 The above War Diary Report was accessed here on the War Diaries of the First World War on Library and Archives Canada. 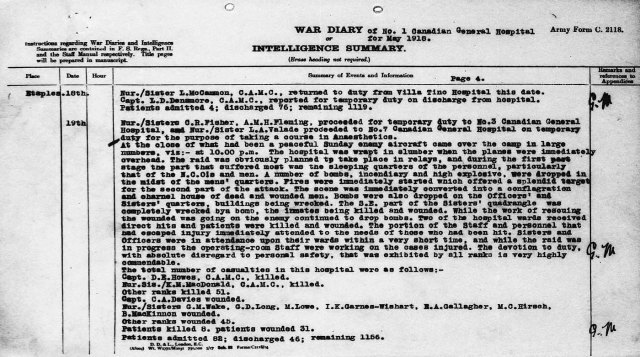 The following excerpt from this UK War Diary. With gratitude to the National Archives of Canada for their rich archival collection. I intend for this information, from a wide variety of sources, to honour my grandfather and my family and to help us complete a narrative of our national history as it relates to one family.